Harley Hill Farm and the Community Perfect together! Community. 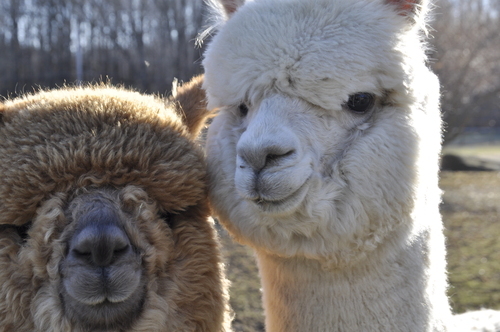 Bill and Lori’s real love is sharing their alpacas. Here are some of the community outreach and events that they have been involved with. 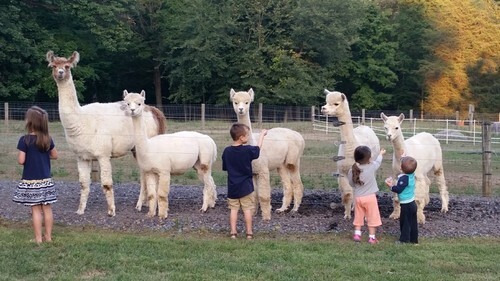 Bucks County 4-H Pronking Pacas Club – Harley Hill Farm has sponsored the very first Llama/Alpaca Club in Bucks County PA. There are over 20 club members. Most of these children do not live on a farm or have an alpaca or llama of their own, so they are assigned a “Harley Hill” alpaca as their project. 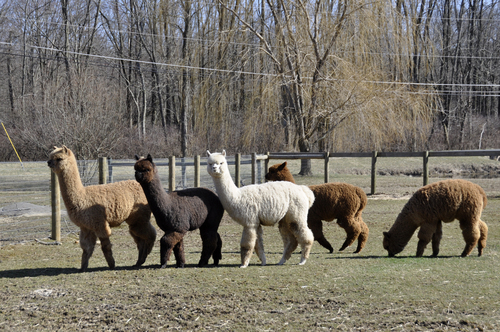 Members come to the farm once a month for a meeting, and also have an “open farm” day each month to come and work with their assigned alpacas. The Mommy and Me Alpaca Extravaganza. This is an annual event which is always the last full weekend in June. The Mommy and Me event is designed for new and perspective alpaca breeders to come and take part in the 2 days of free seminars, and if they are ready to buy, there are 8 local alpaca breeders present under a great tent, with a huge variety of alpacas to choose from. Each participating farm must bring at least one female with a cria at side, who is either re-bred or who is sold with a free breeding. These 3 in 1 packages make it more affordable for new breeders to be able to start farming and enjoy the “alpaca lifestyle”. Boy Scout, Girl Scout and Home School Visits – Harley Hill Farm Alpacas opens their doors “and gates” with an educational opportunity for parents to bring their children to the farm to learn about farming and alpacas. The only admission fee is that each child is asked to bring an item of non-perishable food that is then donated to the Quakertown PA Food Pantry. Delta Epsilon Beta Sorority work days – There is a wonderful group of Animal Science and Agricultural majors from Delaware Valley College that come help with the farm work about once a month. These girls are not afraid to get dirty! They help with everything from cleaning pastures and stalls to toenail trims and medication. They even helped to clean and repaint all of the twenty seven windows in the alpaca barn last fall. 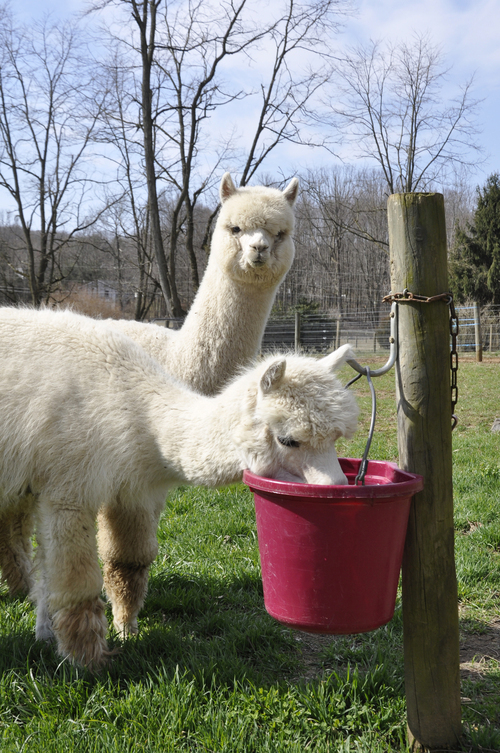 Easter Seals Alpaca Visits – Bill and Lori have developed a relationship with the Easter Seals of Eastern PA in Bethlehem. They bring alpacas to the ES center several times a year to let the children with disabilities experience the feel their very soft fleeces, gentle nature and the big brown eyes of the alpacas. These “therapy” alpacas seem to know how important their job is and they are so very gentle with the children, even letting children on crutches lead them. Watching the reaction of these special kids is by far the best reward that Bill and Lori could imagine. Richland Township Fire Department – Harley Hill Farm Alpacas, and “Romeo” delivered a donation, and alpaca boot inserts to the local volunteer fire department last winter to help keep their feet warm on the fire calls in the cold weather. Most of these fire fighters had never seen an alpaca. Quakertown, PA Our Home Town! – Harley Hill Farm Alpacas is very involved with the “Quakertown Alive” community group. 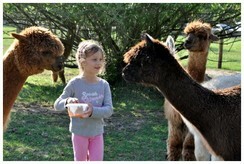 This group has community events throughout the year, and alpacas are one of the main attractions at several of them. In the spring alpacas delight the crowds at the Arts Festival. In addition to bringing a group of adorable alpacas, there is not a better venue to share the beautiful fiber arts that can be created from their ultra soft fleece. Hand spinning and spinning wheel demonstrations are always a big hit. There is also a Quakertown alive Autumn Festival, and Harley Hill Farm Alpacas has donated the Christmas tree for the annual tree lighting ceremony in December. Harley Hill Alpacas are also a favorite at the Children’s summer program held at the Quakertown Library each summer. They had a “pasture side picnic” for an assisted care facility that brought a group of wheelchair bound residents to enjoy an afternoon on the farm. They also have brought alpacas to visit residents at assisted care facilities. On March 25th, 2012, Harley Hill Farm was featured on the national television program “CBS Sunday Morning” with Charles Osgood. In the midst of preparing approximately 350 income tax returns, and over 60 of them are alpaca farmers, I thought it would be a good time to choose a few points that could help save you tax dollars if you have not completed your tax return for last year AND a few pointers to consider that may help you this time next year as you prepare your 2015 returns. 1. Bonus Depreciation – If you purchase a NEW asset, it would be eligible for 50% BONUS depreciation. Why is this important? You would be able to deduct 50% in the year of acquisition, then depreciate the other 50 percent over the depreciable life of the asset. ***warning***You cannot use Sect 179 to further put a farm into a larger loss, unless it is against other positive “earned income” ie: W2 wages or profits from another business. 3. 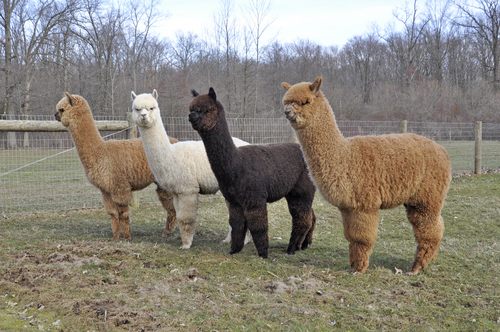 BUYING on TERMS – If you purchased an alpaca or equipment on terms, but did not fully pay for the animal or equip in 2015, be sure to include the FULL purchase price in your 2015 TAX RETURN. You can either depreciate the full amount over 5, 7 or 10 years, or take advantage of the Sect 179 provision above to write off the full cost. see *** warning*** above. 5. We all want to make a profit in the alpaca farming business! 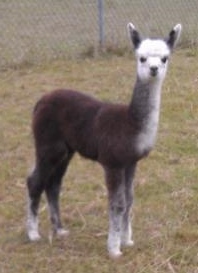 In an agricultural livestock breeding business, it is very important to take advantage of selling your alpacas as a business asset on IRS Form 4797 (if eligible) rather than on the Schedule F, and take advantage of the 15% maximum long term gain rate on farm assets held more than 1 year. IF you are in the 15% bracket – THEN – sale of long term farm assets are taxed at 0% - YES ZERO PERCENT! – This truly is how you can have a nice farming profit and not pay any federal tax!!! 6. Think about paying your children wages for their work on the farm in 2016. If your children (not grandkids) are between the ages of 12 and 18 – then you can pay them without withholding any Social Security, Federal or State tax from their wages. 7. The following is a list of a few commonly missed farm deductions that you should be able to allocate a percentage of, and deduct on your farm return. 8. There is a Fuel Credit for gallons purchased at the pump used “off road” on your farm. Lori Oraschin and her husband Bill Oraschin reside at Harley Hill Farm in Quakertown PA along with 40-50 alpacas at any given time. 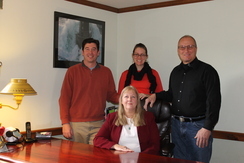 Lori has presented seminars at many aaca and agricultural organization events. 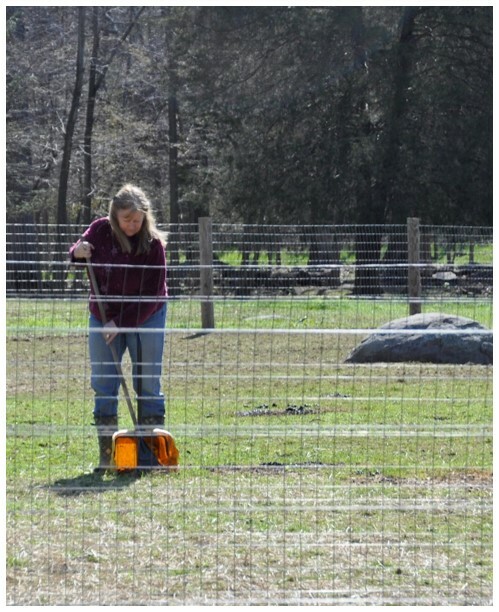 They have many events and seminars at their farm throughout the year including The Mommy and Me Alpaca Event.Be sure to check their website at www.harleyhillfarm.com for the next opportunity to learn more about how you can save using Tax Tips for Alpaca Breeders. DO YOU PAY YOUR CHILDREN TO WORK ON THE FARM? If you are operating your farm as a sole proprietorship, single member LLC or a Mom and Dad Partnership, AND have children between the ages of 12 and 18 years old, you should absolutely be paying your children wages for their work on the farm. Be sure that your children ARE working on the farm. Paying your children without them actually providing the labor services is illegal. Children between the ages of 12 and 18 who work for their parents on a farm are not subject to Social Security Tax, Medicare Tax, Federal Unemployment Tax, or State Unemployment Tax. That means that a gross $100 wage is also a NET $100 wage. As long as your child does not earn more than the “standard” deduction for a single person during the year, ($6,300 for 2015), including wages, interest, dividends, etc. there should be NO federal income tax due, OR a need to file an income tax return. In most cases there would be no taxes due to the state for such a low annual wage. First of all, you will need to file for an EIN “Employer Identification Number” with the IRS if you don’t already have one. You can do this online at www.IRS.gov Be sure that you answer the question for labor as “agricultural”. Then you will also need to register with your state as an employer. Remember to register as “exempt” for state unemployment. Have a meeting with your child and write up a short employment agreement. The agreement should include expected duties, frequency of tasks expected, and pay rate. Check with your state wage and hour compliance division to be sure that you are going to pay at least the minimum wage for hours worked. (Some states have a higher minimum wage rate which supersedes the Federal rate.) You and your child should both sign and date the document and file it away in a safe place. It is also helpful to give a copy to your new employee so that he/she can review what their new job responsibilities are going to be. Next, be sure to pay your child. It is best to pay your child by check to have the best proof of payment. Your child should accept his or her wages, and put the earnings into a bank savings or checking account in their name. Last, in January of the following year, you will be required to provide 2 documents for the government. The first document is called an “Employer’s Annual Federal Return for Agricultural Employees” (Form 943). You will need to enter the number of employees on line 1, then zero fill all of the other lines, sign and send to the IRS. The second document that you need to prepare is a W2 form. One copy needs to be sent to Social Security Administration, and another copy needs to go to your state, along with the W3 transmittal forms. These can be completed in paper or in many cases on-line. You will enter the wages paid in BOX 1, and then in BOX 16 for your state. I know that this might seem like a lot, but the tax savings are worth it! OK, now it is time to complete your income tax return. You should enter the amount paid to your child and reported on the W2 form on line 22, “Labor Hired”, on the Schedule F as a deduction. Let’s assume that you are in the 15% bracket, and your farm does not show a profit. For every $1000 you pay your child, you will save $15% ,(or $150) income tax on your federal tax return. Now, assume that you are self-employed, you are in the 25% tax bracket, and have a farm profit, you will save 25% federal tax, (perhaps 3 to 7% state tax, depending on what state you live in), AND 15% self-employment tax! That would save you $400 or more for every $1000 you paid your children. WOW! Remember, when you paid your child and gave them the money to put into their account? Start teaching your child money management. Your child should be withdrawing his or her wages out of the bank to pay for things such as, school lunch money, school clothes, camp tuition, going to the movies, gifts for their friends birthday parties, and on and on and on. So, why not have an amazing tax deduction for the money that you are handing out to you children anyway? Whatever your child does not spend from his/her earnings, you can invest into a ROTH IRA in their name. If your cash flow allows, you could add to their money an amount up to what their total wages were for the year, up to $5,000 annually. A ROTH IRA is a type of retirement account and is NOT considered in the financial aid analysis process for your child entering college. Sooooo, yes you are right! You can deduct the cost of saving money for your child to go to college. Money can be withdrawn from your child’s ROTH IRA account to pay for higher education expenses PENALTY FREE. Only the “earnings” on the account is taxable at the time of withdrawal, not the original contributions. If your child should not go to college, then they could withdraw up to $10,000 to buy their first home tax and penalty free. Unfortunately, for many of us who became alpaca farmers after our children were grown, these rules DO NOT apply to grandchildren. Boo Hoo. These employment rules however do apply to any other sole proprietorship, single member LLC or Mom and Dad partnership which is not a farm and might file a schedule C. The only difference would be that rather than filing a (Form 943), you would file a (Form 944). In my opinion, this is one of the very best ways of tax planning that I advise. Teach your children how to run a farm through their labor, teach them how to manage money, and teach them how to save for the future. On top of all of this, save thousands in tax dollars! I LOVE the alpaca lifestyle!